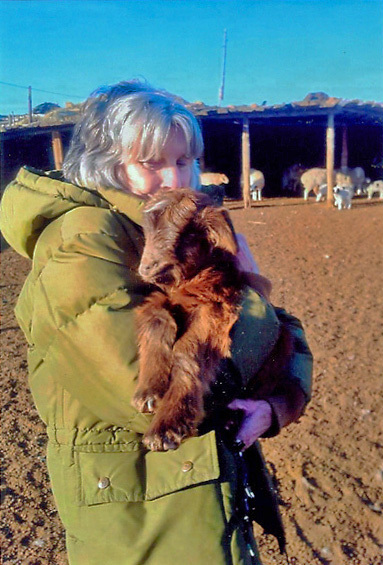 Snow Leopard Conservancy donor Janet Williams made her second trip to Mongolia, in February, 2014. As you can see, Janet doesn’t look her age, nor was she daunted by “Bold,” the intrepid Land Cruiser in which she would spend much of two weeks covering nearly 1000 miles of desert tracks through the last remaining habitat of Mongolia’s wild Bactrian camels. 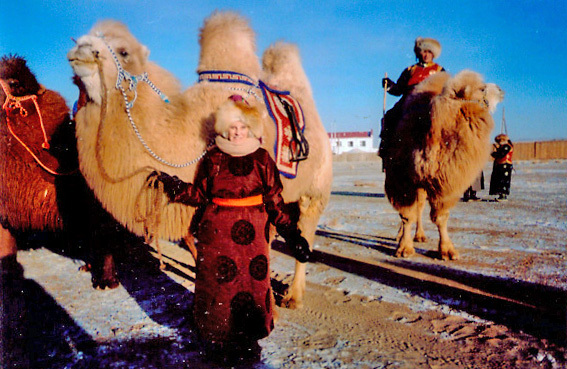 And—as much as she loves snow leopards—it was camels she went to see. A few facts about these amazing, endangered animals: In the absence of fresh water, they are adapted to drinking water with a higher salt content than sea water. Domestic Bactrian camels cannot drink water with this degree of salt. Wild Bactrian camels migrate over huge distances in pursuit of unreliable salt water sources and meager grazing. They can survive extremes of temperature varying from -40 to 130 degrees Farenheit. 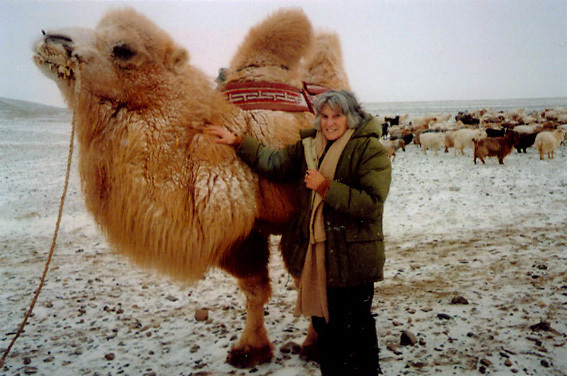 Janet visited, by special invitation, the Wild Camel Breeding Center, in the far southwestern Gobi. This center was established by the Wild Camel Protection Foundation in 2003, as a safeguard against the extinction of the wild Bactrian camel in Mongolia. Janet also attended a local camel festival, which was all about the Bactrian camel and it’s important role in the lives of the Gobi Desert nomads. Festival competitions included the most adorable camels and the best looking couple on camelback. If you come to see The Leopard in the Land, you’ll get to meet Keesa, a domestic Bactrian camel, who will be greeting guests at the reception. The People: Those I have been fortunate enough to meet are kind, interested, and interesting. I, an old woman of 83, was treated like everyone else. One is not discriminated against because of age, either by being treated dismissively or by being catered to. The Land: I have been mostly in the Gobi and it is a myth that the earth is round. The earth is flat. Like a plate. I have witnessed this by standing in the middle of the Gobi. Goats- I was allowed to hold one. It looked at me with its horizontal pupils and whimpered pitifully as it viewed its goat friends. Horses- Observing two riders approaching like the wind, I marveled at the sight, wondering how many years it takes to ride like that. They arrived. The horses were handsome. The riders, two boys, were about six. Camels- There is no way to describe Bactrian camels in below zero weather in full fluff. They look prehistoric. They are handsome, aloof, and other-worldly. A herder told me they also have soft hearts. The breeding center takes steps to ensure that camels born there are not habituated to humans; they are released into the wild at about 3 years of age. Dovchindorj, the director, while being a serious scientist, loves the camels and gives some of them names. These names will be carried down from mother to daughter or father to son, through the generations. ← Conservation Education Makes Lion Hearted Kids!